How Many iPads Have Been Sold? Apple has sold a whopping 360 million iPads since the original debuted in 2010. These sales figures include the original 9.7-inch iPad and the 7.9-inch iPad Mini, which was introduced in 2012. The original iPad sold 3.27 million units in its first quarter and was deemed a whopping success. Apple sold 16.12 million in the first quarter of their fiscal 2016 and this number was called a disappointment because it failed to surpass the 21.42 million sold in the first quarter of 2015 or the 26.04 million sold in the first quarter of 2014. It is important to note that Apple's fiscal year starts in October, so "Q1" sales account for the holiday season. While the original iPad debuted in March, they switched to an October-November time frame with the 4th generation iPad. In 2016, they announced the 9.7-inch iPad Pro in March and skipped announcing a new iPad in the Fall. In 2018, they announced a 9.7-inch "iPad" model in March and two "iPad Pro" models in October. In a word: Yes. But this is to be expected. If the computer were just now invented, it would have amazing sales for the first five years, but eventually, most people that wanted a computer would already have one. This means new sales would have to come from some other avenue, such as businesses, markets where people couldn't ordinarily afford a computer, or upgrades from people who felt their computer was just too slow. The upgrade cycle is what really drives the industry. Most of us have a computer, and we only buy one when our old one breaks or becomes too outdated. The iPad is just now starting that same cycle, with the iPad 2 and original iPad Mini —two of the best-selling iPads of all time — now among the best iPads that are obsolete. Apple is also focusing more on the enterprise market with the release of the iPad Pro line of tablets. These newer iPads rival a laptop in terms of pure performance and are paired with a new Smart Keyboard accessory. Apple also has a partnership with IBM to develop enterprise solutions in various industries. And while the iPad may never again reach peak sales like the 26 million units sold in the first fiscal quarter of 2014, iPad sales have mostly stabilized. 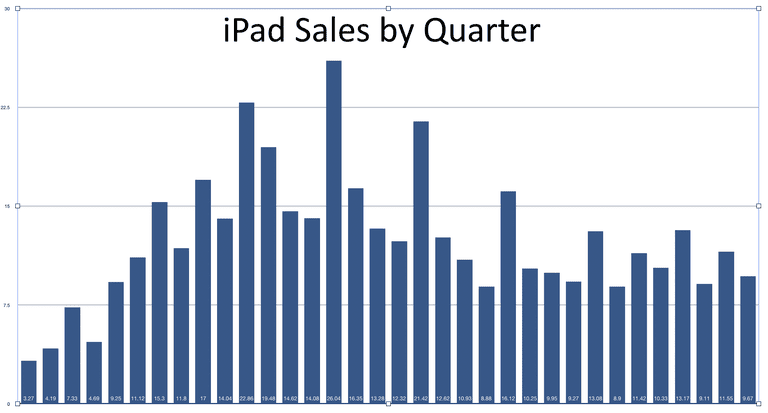 Apple sells approximately 10 million iPads per quarter. In a phone call following the end of the fiscal fourth quarter in 2018, Tim Cook announced they would no longer report iPhone and iPad sales. Does the iPad Have a SIM Card?